114 – Removal of calculus (or tartar) on teeth by a scaler, which includes a cleaning paste – can be claimed only every six months. This mass of calcified bacteria over hangs the gum as its size grows and extends down the side of the tooth into the gums. The gum has a natural gap next to the tooth and above the bone. In a healthy state, this gap is usually about 3mm and is called the gingival sulcus. Nastier bacteria can survive in the closed environment between the gums, bone and calculus. They are anaerobic bacteria – “oxygen hating”. The body, in the meantime, is kicking into gear with its immune system; by increasing more blood flow to the area, which carry all cells and components to kill the bacteria. 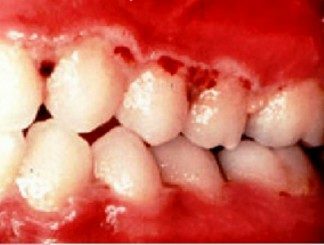 The gums become swollen and leak fluid out of the blood vessels into the gingival sulcus. The gums bleed because of the bacteria around the calculus. Sounds great… sort of; except the calculus is not shifted by the body’s defences. 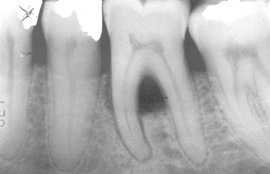 The longer the calculus has time to build up, the further down the tooth and subsequently down the root the mass grows. The sulcus becomes unhealthily deeper. This below the gum calculus is called subgingival. The bone around the tooth starts to get destroyed, and eventually the body “rejects” the tooth! Bring in the white knight – the dentist! For this situation, removing the supragingival calulus first allows the irritation and swelling to the gums to reduce. It is less painful. Even though the gums bleed when the scaling is done, the dentist can see this calculus easily. Subgingival calculus is harder to see and more painful to remove. 115 – Subsequent removal of calculus (or tartar) on teeth by a scaler, which includes a cleaning paste – can be claimed only within three months of a 114. For the dentist it means it’s easier to see the calculus and less bleeding; and for the patient, less pain and a better treatment for the long term. Happy gums, happy mouth, happy health, and happy life.